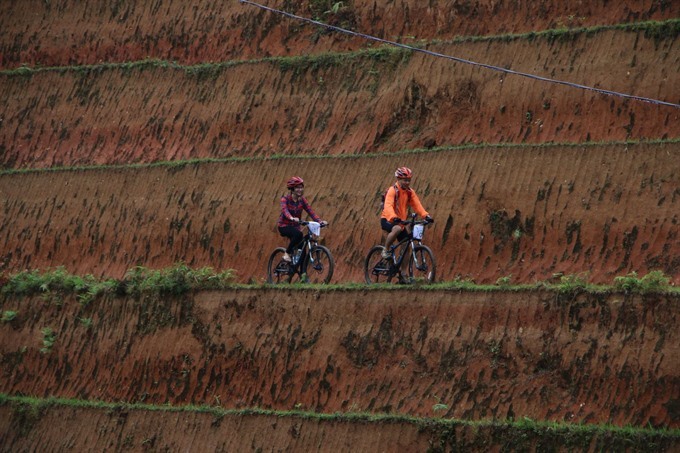 Tourists join a bike tour in Hoang Su Phi District, in the northern mountainous province of Ha Giang. Apart from providing economic opportunities, the project’s goal is to “improve livelihood through community-based tourism”, which in turn is expected to improve environmental conditions and help preserve the traditional cultures of the selected ethnic minority communities living in Ha Giang Province’s Hoang Su Phi District and Cao Bang Province’s Trung Khanh and Quang Yen districts. Community-based tourism involves local ownership and management, and offers tourists the chance to learn about and experience the culture, work environment and lifestyle of the local communities. The project is being implemented by HELVETAS Swiss in Viet Nam and CRED, an in-country offshoot of HELVETAS. Their previous rural development projects in selected areas have shown that this region is ideally suited for community-based tourism initiatives, said Cao Đại Hùng, who is in charge of community-based tourism at CRED. The selected regions are home to many ethnic minorities who have maintained their unique traditions but are among the poorest people in Viet Nam. Breath-taking landscapes such as rice terraces, limestone mountains and impressive waterfalls make these regions ideal for sustainable tourism activities. Since 2015, HELVETAS and CRED officials have made a number of visits to these areas to assess the social-economic situation, people’s main source of income, the gender role in current production activities, as well as to determine the locals’ willingness towards community-based tourism development. During these visits, HELVETAS and CRED have formed business partnerships with six villages, and have trained locals to provide quality tourism services to visitors. The first commercial tour, Hoàng Su Phì Mountain Bike Challenge, was organised from May 18 to 21, and is an important first step in establishing various community-based tourism activities in the area. Apart from cycling, participants interacted with locals and did one day of voluntary work that directly benefits an ethnic minority village. The trip is free of cost, but requires a donation to a local community fund. More tour packages and activities are currently being developed and will be offered by the Vietnam Responsible Tourism (VRT) in the near future. Gavino Strebel, a tourist from Switzerland who was part of the Hoang Su Phi bike tour, said that Hoang Su Phi is an ideal tourist place, and particularly suited for bike riding. The local people were very friendly and traditional dishes were good, he said, adding that it was an interesting experience and that everyone should try it once in life. Lu Van Chung, vice-chairman of Hoang Su Phi District’s People’s Committee, said the local authorities would create favourable conditions for the implementation of the community-based tourism development project and would upgrade infrastructure to welcome more tourists.